This page is not entirely up to date :) but contains many resources not available on my other pages. For up to date visit my UiB homepage. Macro-invertebrate decline in surface water polluted with imidacloprid PLOS ONE, 8(5): e62374 (2013). Bijdrage aan Ronde Tafel Gewasbescherming Tweede Kamer 3 Nov 2010 [In Dutch]; Verder lezen: 1; 2; 3. Interview Casa Luna Radio terugluisteren (zie ook de aankondiging). Jeroen van der Sluijs: Responsible Evidence Appraisal 24 Aug 2016 from LawTransform on Vimeo, Slides with refs. 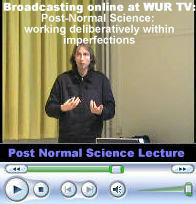 [English] Studium Generale Wageningen: Video Lecture Post Normal Science: working deliberatively within imperfections (90 minutes), Wageningen, 21 March 2007. Seconday address: Utrecht University - Copernicus Institute of Sustainable Development; Department of Innovation, Environmental and Energy Sciences; Faculty of Geosciences; Heidelberglaan 2; 3584 CS Utrecht; The Netherlands. Email: J.P.vanderSluijs@uu.nl, Room: 11.28, Van Unnikgebouw. Full Professor (tenured term) Centre for the Study of the Sciences and the Humanities, University of Bergen. Associate Professor/Senior Researcher (part time, tenured term) Department of Innovation, Environmental and Energy Sciences, Copernicus Institute of Sustainable Development, Utrecht University. J.P. van der Sluijs, J.C.M. van Eijndhoven, B. Wynne, and S. Shackley (1998) Anchoring Devices in Science For Policy: The Case of Consensus Around Climate Sensitivity, Social Studies of Science, vol 28, 2, p. 291-323. J.P. Van der Sluijs, (2012) Uncertainty and dissent in climate risk assessment, a post-normal perspective, Nature and Culture, 7 (2):174-195. M. Hulme, M. Mahony, S. Beck, C. Görg, B. Hansjürgens, J. Hauck, C. Nesshöver, A. Paulsch, M. Vandewalle, H. Wittmer, S. Böschen, P. Bridgewater, M. Chimère Diaw, P. Fabre, A. Figueroa, K. Luen Heong, H. Korn, R. Leemans, E. Lövbrand, M. Norowi Hamid, C. Monfreda, R. Pielke Jr., J. Settele, M. Winter, A.B.M. Vadrot, S. van den Hove, J.P. van der Sluijs (2011) Science-Policy Interface: Beyond Assessments. Science, 333 (6043) 697-698. E. Laes, G. Meskens and J.P. van der Sluijs (2011) On the contribution of external cost calculations to energy system governance: The case of a potential large-scale nuclear accident. Energy Policy, 39 (9) 5664-5673. L.J. Smale en J.P. van der Sluijs (2011) Het rijksinpassingsplan Zuidring: de 380 kV hoogspanningslijn van Wateringen tot Zoetermeer. De planologische inpassing van het voorzorgsbeginsel. Tijdschrift voor gezondheidsschade, milieuschade en aansprakelijkheidsrecht, 25 (2) 63-75. J.A. Wardekker, A. de Jong, J.M. Knoop and J.P. van der Sluijs (2010), Operationalising a resilience approach to adapting an urban delta to uncertain climate changes, Technological Forecasting and Social Change 77 (6), 987-998. Gezondheidsraad (2011). Nanomaterialen in afval. Signalement. Gezondheidsraad publicatie 2011/14, Den Haag. J.A. Wardekker, A. de Jong, J.P. van der Sluijs (2010) Expert elicitation on uncertainty, climate change and human health. Report commissioned by: Netherlands Environmental Assessment Agency. Department of Science, Technology and Society, Report NWS-E-2010-71, Utrecht University, Utrecht, The Netherlands. P. Kloprogge, J.P. van der Sluijs and A. Wardekker. Uncertainty communication: issues and good practice, report NWS-E-2007-199, Department of Science Technology and Society, Copernicus Institute, Utrecht University. 60 pp. S. Dessai and J.P. van der Sluijs, 2007, Uncertainty and Climate Change Adaptation - a Scoping Study, report NWS-E-2007-198, Department of Science Technology and Society, Copernicus Institute, Utrecht University. 95 pp. For more publications see full publication list below. An introductory lecture "Post Normal Science, working deliberatively within imperfections" is now available online at WUR TV. The lecture was held at Studium Generale of Wageningen University on 21 March 2007. Click here to see the lecture on WUR TV with smart navigation through the slides (requires Internet Explorer), please note that after clicking the link it takes some minutes for the video to start. Alternatively the slides can be downloaded seperately. A post normal science letcure in Dutch (with slides handout) is also available (Studium Generale Utrecht lecture 21 October 2009). 2011 - present Associate Professor (tenured term) Environmental Sciences, Copernicus Institute, Utrecht University. 2001 - 2010, Assistant Professor/Senior Researcher (tenured term) Department of Science, Technology and Society (STS), Copernicus Institute, Utrecht University. 1996 YSSP Fellow, International Institute for Applied Systems Analysis (IIASA), Laxenburg, Austria. 1992-1996 Ph.D. candidate - (coping with uncertainty in climate risk assessment models), Department of Science, Technology and Society, Utrecht University. 1991 Junior researcher, Department of Science, Technology and Society, Utrecht University. Senior Qualification Research (WP-FLOW SKO Senior Researcher), granted March 2005. Base Qualification Education (WP-FLOW BKO Lecturer), granted January 1999. 2001: Initiator of a EU-FP6 Expression of Interest for a Network of Excellence on the Management of Uncertainty in Science for Sustainability (submitted jointly with 18 core partners plus 40 associated partners). 9-11 December 2004 Expert Workshop Uncertainty Communication. Utrecht. 25 June 2003, Uncertainty in environmental health risk science and policy, Antwerp (I chaired one of the parallel sessions). 11 November 2002, Managing Uncertainty in science for suSTainability: future research challenges for Europe, side event workshop at the start conference of the 6th Framework Programme: "European Research 2002, The European Research Area and the Framework Programme", Brussels, 11-12-13 November 2002 . 22 November 2001, De Bilt, User workshop "Guidance for uncertainty management in Environmental Assessment" RIVM (In close collaboration with the RIVM ). 25 October 2001, Utrecht The Netherlands: International Expert workshop "Uncertainty management in Environmental Assessment"
12-13 June 2001: NUSAP workshop Uncertainty Assessment TIMER model, Loosdrecht, The Netherlands. The research cluster Energy and Global Change: Dealing with Risks and Uncertainties that I established and lead within STS and the Copernicus Institute, aims at conceptual work on uncertainty in model based environmental risk assessment, along with the (further) development of methodologies that facilitate a better management of uncertainty, quality, plurality and value judgements in risk assessment, integrated environmental assessment, and sustainability assessment. We focus on those situations where scientific assessment is used as a basis for policy making on environmental risks, before conclusive scientific evidence and scientific consensus are available on the causal relationships, the magnitude and the probabilities of these risks. Policy decisions on such risks (e.g. climate change) cannot wait until the scientific understanding is complete, thus the knowledge base available for decision making is unavoidably incomplete, controversial and uncertain and in this setting unquantifiable uncertainties are often more important than quantifiable ones. This poses high demands on the ways uncertainties and dissent are dealt with in scientific assessment and how these are communicated to policy makers and society. My program aims to develop new multidisciplinary and deliberative tools and strategies for coping explicitly with scientific uncertainty and scientific controversy in science for policy, that meet these high demands. Tools for multidimensional uncertainty assessment, risk assessment, and strategies for risk and uncertainty management and communication (led by me). (i) Development, demonstration and testing of the NUSAP method for multidimensional uncertainty assessment to a variety of cases including RIVM's IMAGE/TIMER Energy model. In 2005, an overview article of our experiences with the NUSAP method in various cases and projects was published in Risk Analysis. Together with TNO-MEP we have conducted a comprehensive NUSAP-based uncertainty assessment of NOx, SO2 and NH3 emissions in the Netherlands, using our NUSAP methodology. (ii) Development under my leadership of a state of the art Guidance for uncertainty assessment and communication for the RIVM-MNP. The guidance we developed used inputs from about twenty international top scientists in the field and we also organised, jointly with RIVM, a peer review of the guidance materials. Since the end of 2003 the guidance is a standard in the RIVM/MNP. It has attracted worldwide attention from inter alia the US Environmental Protection Agency (US-EPA), the European Environmental Agency (EEA) and the Inter Governmental Panel on Climate Change (IPCC). With these and other groups we are exploring the opportunities to start joint projects and collaborations in this field. This has already lead to a collaboration with the US-EPA, and ad-hoc collaborations with the UK Flood Risk Management Research Consortium and the EU HarmoniCa project on the EU Water Framework Directive, who both involved us in their own projects to develop Uncertainty Analysis Guidance Documents (example). At present we do a project for MNP on Uncertainty Communication, using the Utrecht Policy Laboratory. (iv) The Ph.D. work by Penny Kloprogge, aiming at the analysis and development of strategies to (better) manage value-ladenness in Integrated Assessment Modelling of climate change. Kloprogge made an analysis of the various ways in which stakeholder knowledge and perspectives have been included in integrated assessment modeling practice. She participated in the IIASA Young Scientist Summer Programme 2001, during which she studied the roles of value ladenness and (subjective) choice in the process of building assessment models, based on a large number of in-depth interviews with modelers at IIASA. Building further on these insights she developed in close collaboration with the RIVM an innovative method for the systematic review and critical appraisal of assumptions in model based foresight studies. The method has been demonstrated and tested on two environmental indicators from RIVM's 5th Environmental Outlook (EO5) and is now included in the tool catalogue of the RIVM/MNP Guidance on Uncertainty Assessment and Communication. One article is accpeted for publication in Climatic Change, three other journal articles are in preparation. (vi) The joint writing and publishing with an international group of uncertainty experts of a state of the art conceptual paper "Defining Uncertainty: A conceptual Basis for Uncertainty Management in Model Based Decision Support" (Walker et al., 2003) in the journal Integrated Assessment. The paper presents a typology for uncertainty in the form of a matrix that distinguishes between location (context, model, inputs, parameters or model outcomes) and level (statistical uncertainty, scenario uncertainty, recognized ignorance) and nature (epistemic versus variability uncertainty). (vii) The publication of the book Learning to Manage Global Environmental Risks, a functional analysis of social responses to climate change, ozone depletion, and acid rain, a two volume 600 page peer reviewed book. I co-authored 3 of the 22 chapters of the book. The book the book is co-edited by a then member of our group (Prof. Dr. Josee van Eijndhoven) and presents the findings of a major 4 year international research program. Empirical research in the Utrecht Policy Lab: What are (in environmental assessment studies) good ways to communicate uncertainty information to policy makers? IIASA (International Institute for Applied Systems Analysis), SEI (Stockholm Environmental Institute), Rathenau Institute, EC-JRC (European Commission, Joint Research Centre, Ispra); US-EPA, RIVM (National Institute of Public Health and the Environment, The Netherlands), PBL, EL&I-nVWA, VROMRaad (Advisory Council of the Ministry of Housing Physical Planning and Environment, The Netherlands), SENTER NOVEM, French Ministry of Environment; Norwegian Research Council. Utrecht: Master Sustainable Development; Master Energy Sciences. Free University of Amsterdam master programmes "management, policy-analysis and entrepreneurship in health and life science" and "international public health". e-KAM school 2006 (La Laguna, Açores, Utrecht, Bergen, Santiago, Los Andes): e-Learning Course on Knowledge Assessment and Extended Participation. THEMES Summer School 2006 (Barcelona) Emerging Theories and Methods in Sustainability Research: Analysing Complexity. KAM Fall School 2005 (Ispra): Knowledge Assessment Methodologies. TIAS Summer School 2005 (Osnabruck) Stakeholder Participation and Modelling in Sustainable Resource Management. Teaching in the SENSE Ph.D. course "Issues in quantitative analysis and modelling: energy, materials, and waste"
Three-day invited training course "The Precautionary Principle and Uncertainty", Escola Nacional de Saúde Pública Sergio Arouca, Fiocruz, Rio de Janeiro, 21-22 March 2006. One day advanced course "Guidance for Uncertainty Assessment, Management and Communication" Universities of Twente and Osnabruck, 7 Dec. 2005. Most topical list via Google Scholar sorted by year, the list below is not up to date! J.P. van der Sluijs, Anchoring amid uncertainty; On the management of uncertainties in risk assessment of anthropogenic climate change, Ph.D. Thesis, Universiteit Utrecht, 1997, 260 pp. A. Saltelli, Â. Guimarães Pereira, J.P. van der Sluijs and S. Funtowicz (in press/2012) What do I make of your Latinorum? Sensitivity auditing of mathematical modelling, Foresight and Innovation Policy [draft via arXiv:1211.2668]. Jeroen P. van der Sluijs, Arthur C. Petersen, Peter H. M. Janssen, James S. Risbey et Jerome R. Ravetz (2012) Etablir la qualité des preuves pour des situations de décision complexes et controversées" (traduit de l'anglais par Annike Thierry), Hermès, 64: 165-174. L.J. Smale and J.P. van der Sluijs (2011). Het rijksinpassingsplan Zuidring: de 380 kV hoogspanningslijn van Wateringen tot Zoetermeer. De planologische inpassing van het voorzorgsbeginsel. Tijdschrift voor gezondheidsschade, milieuschade en aansprakelijkheidsrecht, 25 (2) 63-75 (in Dutch). E. Lebret and. J. P. van der Sluijs (2010) Voorzorg bij onzekere milieu-gezondheidsrisico's; het voorbeeld van elektromagnetische velden, Aansprakelijkheid, Verzekering & Schade, 2010, 5, 196-205. A.B. Knol, P. Slottje, J.P. van der Sluijs, E. Lebret (2010) The use of expert elicitation in environmental health impact assessment: a seven step procedure, Environmental Health 9:19. Bas van Ruijven, Jeroen P. van der Sluijs, Detlef P. van Vuuren, Peter Janssen, Peter S. C. Heuberger and Bert de Vries (2010) Uncertainty from model calibration: applying a new method to transport energy demand modelling, Enivronmental Modelling & Assessment 15 (3) 175-188. H.A.C. Runhaar, P.P.J. Driessen, L. van Bree, and J.P. van der Sluijs (2010), A meta-level analysis of major trends in environmental health risk governance Journal of Risk Research, 13 (3). Bas van Ruijven, Bert de Vries, Detlef van Vuuren, Jeroen van der Sluijs (2010), A global model for residential energy use: Uncertainty in calibration to regional data, Energy 35, 269-282. J.A. Wardekker, A.C Petersen, J.P. van der Sluijs (2009), Ethics and public perception of climate change: Exploring the Christian voices in the US public debate. Global Environmental Change, 19 (4) 512-521. A. Knol, A.C. Petersen, J.P. van der Sluijs and E. Lebret (2009) Dealing with uncertainties: The case of environmental burden of disease assessment, Environmental Health 8:21. M.K. von Krauss, M Kaiser, V Almaas, J.P. van der Sluijs and P Kloprogge (2008), Diagnosing & Communicating Scientific Uncertainty: a Case Study of Transgene Silencing, Science of the Total Environment, 390, 23-34. J. van der Sluijs, J.-M. Douguet, M. O’Connor, J.R. Ravetz, (2008). Evaluation de la Qualité de la Connaissance dans une Perspective Délibérative. VertigO – La revue en sciences de l'environnement, 8 (2), octobre 2008, 1-9. Jens Christian Refsgaard; Jeroen P van der Sluijs; Anker Lajer Højberg; Peter A Vanrolleghem (2007), Uncertainty in the Environmental Modelling Process: A framework and guidance, Environmental Modelling & Software. 22 (11), 1543-1556. L. Maxim and J.P. van der Sluijs (2007), Uncertainty: cause or effect of stakeholders' debates? Analysis of a case study: the risk for honey bees of the insecticide Gaucho®, Science of the Total Environment, 376, 1-17. J.P. van der Sluijs, M. Kaiser, L. Maxim, J.M. Douguet (2007), Le principe de précaution, un principe pour agir dans des situations d'incertitude, Risques, 72, p. 75-81. L. Maxim, J.P. van der Sluijs, J.M. Douguet (2007), Mettre en oevre le principe de precaution: une approache pragmatique, Risques, 72 p. 93-105. Jens Christian Refsgaard, Jeroen P. van der Sluijs, James Brown and Peter van der Keur (2006), A Framework For Dealing With Uncertainty Due To Model Structure Error, Advances in Water Resources, 29 (11), 1586-1597. P. Kloprogge and J. van der Sluijs (2006) The inclusion of stakeholder knowledge and perspectives in integrated assessment of climate change. Climatic Change, 75 (3) 359-389. M.P. Krayer von Krauss, W.E. Walker, J. P. van der Sluijs, P. Janssen, M.B.A. van Asselt, and J. Rotmans (2006). Response to "To what extent, and how, might uncertainty be defined" by Norton, Brown, and Mysiak, Integrated Assessment, 6 (1), 89-94. Jeroen van der Sluijs (2005), Uncertainty as a monster in the science policy interface: four coping strategies. Water science and technology, 52 (6), 87-92. Janssen, P.H.M., Petersen, A.C., Van der Sluijs, J.P., Risbey, J., Ravetz, J.R. (2005), A guidance for assessing and communicating uncertainties. Water science and technology, 52 (6) 125-131. Jeroen van der Sluijs, Matthieu Craye, Silvio Funtowicz, Penny Kloprogge, Jerry Ravetz, and James Risbey (2005), Experiences with the NUSAP system for multidimensional uncertainty assessment in Model based Foresight Studies, Water science and technology, 52 (6), 133-144. H. Groenenberg and J. van der Sluijs (2005), Valueloading and Uncertainty in a Sector-Based Differentiation Scheme for Emission Allowances, Climatic Change, Vol. 71 (1), 75115. J.P. van der Sluijs James Risbey and Jerry Ravetz (2005), Uncertainty Assessment of VOC emissions from Paint in the Netherlands, Environmental Monitoring and Assessment, 105, p. 229-259. Heleen Groenenberg, Kornelis Blok, Jeroen van der Sluijs (2005). Projection of energy-intensive material production for bottomup scenario building. Ecological Economics 53 (2005) 7599. H. Groenenberg, K. Blok and J. van der Sluijs (2004), Global Tryptych  A Bottom-up Approach for the Differentiation of Commitments. Climate Policy, Vol 4 (2), p. 153-175. W.E. Walker, P. Harremoës, J. Rotmans, J. P. van der Sluijs, M.B.A. van Asselt, P. Janssen, and M.P. Krayer von Krauss (2003) Defining Uncertainty A Conceptual Basis for Uncertainty Management in Model-Based Decision Support, Integrated Assessment, Vol.4 No.1 (2003), pp. 5-17. J.P. van der Sluijs, A way out of the credibility crisis around model-use in Integrated Environmental Assessment, Futures, 34 (2002) 133-146. J.P. van der Sluijs, Integrated Assessment Models and the Participatory Challenge The case of Climate Change. In: Dunn, William N.; Hisschemoller, Matthijs; Hoppe, Rob; Ravetz, Jerry R., Knowledge, Power, and Participation in Environmental Policy Analysis, special issue Policy Studies Review Annual, Transaction Pub, 2001, p317-348. J.P. van der Sluijs and J.C.M. van Eijndhoven, Closure of Disputes in the Assessments of Climate Change in the Netherlands Arena Environmental Management, vol. 22, 4, 1998, p.597-609. J. Klabbers, J.P. van der Sluijs and R. Ybema, Handling uncertainties of global climate change: mapping the policy/science interface, in: Milieu - Journal of Environmental Sciences, vol 13, 5, 1998, p. 286-296. J.P. van der Sluijs, G.J. de Bruyn, and P. Westbroek, Biogenic Feedbacks in the Carbonate-Silicate Geochemical Cycle and the Global Climate, American Journal of Science, 296 (8), 1996, p.932-953. J.P. van der Sluijs, C.A. Hendriks, K. Blok, Feasibility of polymer membranes for carbon dioxide recovery from flue gases, Energy Conversion and Management, 33, 1992, p. 429-436. S. Dessai and J.P. van der Sluijs (2011). Modelling climate change impacts for adaptation assessments, in Stephen Senn, Philip Dawid, Mike Christie and Kenneth Andrew Cliffen (2011). Simplicity, complexity and modelling, John Wiley & Sons, Chichester, 83- 102. J.P. van der Sluijs, A. Petersen and S. Funtowicz (2011). Reflective approaches to uncertainty assessment and communication. In: J. Lentsch and P. Weingart (eds. ), The Politics of Science Advice, Institutional Design for Quality Assurance, Cambridge University Press, 259-269. J. H. Spangenberg, Akenji, L., Le Kama, A. A., Bauler, T., Binimelis, R., Douguet, J.-M., Bednar-Friedl, B., Jäger, J., Kamienicki, K., Kuldna, P., Luukanen, J., Martínez-Alier, J., Maxim, L., O'Connor, M., Peterson, K., Rodriguez-Labajos, B., Ryden, L., Steinmüller, K., Svedin, U., Ulgiati, S., Uustal, M., van der Sluijs, J., Settele, J. (2010). The future contributions of socio-economic research to the conservation of biodiversity In: Settele, J., Penev, L., Georgiev, T., Grabaum, R., Grobelnik, V., Hammen, V., Klotz, S., Kotarac, M., Kühn, I. (Hrsg. ): Atlas of biodiversity risk, Pensoft, Sofia, 204-206. Jens Christian Refsgaard, Jeroen P. van der Sluijs, Anker Lajer Højberg and Peter A. Vanrolleghem (2010) Uncertainty analysis in model-based water management, In: Peter A. Vanrolleghem (ed. ), Modelling Aspects of Water Framework Directive Implementation, Volume 1, IWA Publishing, London, 271-333. J.P. van der Sluijs (2010). Uncertainty and complexity: the need for new ways of interfacing climate science and climate policy. In: P. Driessen P. Leroy, and W. van Vierssen, From Climate Change to Social Change: Perspectives on Science - Policy Interactions, International Books, Utrecht, 31-49. J.-M. Douguet, M. O'Connor, J.P. van der Sluijs, P.H.M. Janssen, A.C. Petersen (2009). Uncertainty Assessment in a Deliberative Perspective. In: A. Pereira Guimaraes and S. Funtowicz. Science for Policy, Oxford University Press, pp 15-47. L. Maxim, and J.P. van der Sluijs (2009). Multi-causal Relationships in their Socio-political Context. In: In: A. Pereira Guimaraes and S. Funtowicz. Science for Policy, Oxford University Press, pp 67-80. M. Craye, E. Laes, J. van der Sluijs (2009). Re-negotiating the Role of External Cost Calculations in the Belgian Nuclear and Sustainable Energy Debate. In: A. Pereira Guimaraes and S. Funtowicz. Science for Policy, Oxford University Press, pp 272-290. H.A.C Runhaar, J.P. van der Sluijs and P.P.J. Driessen (2008). Shifts in Environmental Health Risk Governance: An Analytical Framework, in: S. Martorell, C. Guedes Soares & J. Barnett (eds.). Safety, Reliability and Risk Analysis; Theory, Methods and Applications, CRC Press, London, vol. 1, pp. 369-378. J. van der Sluijs et M. Kaiser, Vers une compréhension commune du principe de précaution. In P. Allard, D. Fox and B. Picon, Incertitude et environnement, La fin des certitudes scientifiques, EDISUD, 2008. L. Maxim and J.P. van der Sluijs, L'incertitude: cause ou effet des débats entre les acteurs? Analyse de cas du risque pour les abeilles de l'insecticide Gaucho. In P. Allard, D. Fox and B. Picon, Incertitude et environnement, La fin des certitudes scientifiques, EDISUD, 2008. Jeroen P. van der Sluijs, Uncertainty, assumptions, and value commitments in the knowledge-base of complex environmental problems, in: Ângela Guimarães Pereira, Sofia Guedes Vaz and Sylvia Tognetti, Interfaces between Science and Society, Green Leaf Publishing, 2006, p.67-84. J.P. van der Sluijs and W. Turkenburg, Climate Change and the Precautionary Principle. In: Elizabeth Fisher, Judith Jones and René von Schomberg, Implementing The Precautionary Principle, Perspectives and Prospects, ELGAR,2006. J. van der Sluijs, Integrated Assessment, in: R E Munn and M Tolba (eds.) Encyclopaedia of Global Environmental Change, Volume 4 , Responding to global environmental change, pp 250253,Wiley, London, 2002. J. van der Sluijs, Definition of Integrated Assessment, in: R E Munn and M Tolba (eds.) Encyclopaedia of Global Environmental Change, Volume 4 , Responding to global environmental change, Wiley, London, 2002, pp 249-250. J. van der Sluijs, ULYSSES (Urban Lifestyles, Sustainability, and Integrated Environmental Assessment), in: R E Munn and M Tolba (eds.) Encyclopaedia of Global Environmental Change, Volume 4 , Responding to global environmental change, Wiley, London, 2002, pp 460-460. J.C.M. van Eijndhoven, G. Dinkelman, J.P. van der Sluijs and R. Pleune, Finding your Place, A History of the Management of Global Environmental Risks in the Netherlands, in: The Social Learning Group, Learning to Manage Global Environmental Risks: A Comparative History of Social Responses to Climate Change, Ozone Depletion and Acid Rain. MIT Press, 2001, Vol. 1, p. 115-138. J. Jäger, J. Cavender Bares, N. Dickson, A. Fenech, P. Haas, F. Hampson, P. Hughes, A. Liberatore, E.A. Parson, V. Sokolov, F. Toth, C. Waterton, J.P. van der Sluijs, J.C.M. van Eijndhoven, and B. Wynne, Risk Assessment, in: The Social Learning Group, Learning to Manage Global Environmental Risks: A Comparative History of Social Responses to Climate Change, Ozone Depletion and Acid Rain. MIT Press, 2001, Vol. 2, p. 7-30. J. Jäger, Nancy M. Dickson, Adam Fenech, Peter Haas, Edward Parson, Vassily Sokolov, Ferenc Tóth, Jeroen van der Sluis and Claire Waterton, Monitoring, in: The Social Learning Group, Learning to Manage Global Environmental Risks: A Comparative History of Social Responses to Climate Change, Ozone Depletion and Acid Rain. MIT Press, 2001, Vol. 2, p. 31-48. J. van der Sluijs and P. Kloprogge, The inclusion of stakeholder perspectives in Integrated Assessment of Climate Change, in Michael Decker (Ed): Interdisciplinarity in Technology Assessment. Implementations and their Chances and Limits. Series: "Wissenschaftsethik und Technikfolgenbeurteilung", Volume 11, Springer, Berlin Heidelberg New York 2001 p. 199-214. J.P. van der Sluijs, Uncertainty management in integrated modelling, the IMAGE case in: S. Zwerver, R.S.A.R. van Rompaey, M.T.J. Kok and M.M. Berk (eds. ), Climate Change Research; Evaluation and Policy Implications, Studies in Environmental Science 65 B, Elsevier Science B.V., 1995, p.1401-1406. A.C. Petersen, P.H.M. Janssen, J.P. van der Sluijs, J.S. Risbey, J.R. Ravetz RIVM/MNP Guidance for Uncertainty Assessment and Communication: Mini-Checklist & Quickscan Questionairre.. RIVM/MNP; ISBN 90-6960-105-1, 2003. P.H.M. Janssen, A.C. Petersen, J.P. van der Sluijs, J.S. Risbey, J.R. Ravetz . 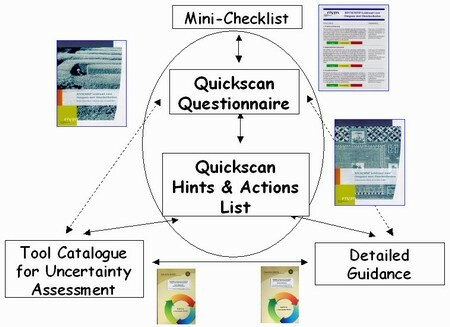 RIVM/MNP Guidance for Uncertainty Assessment and Communication: Quickscan Hints & Actions List. RIVM/MNP, ISBN 90-6960-105-2, 2003. J.P. van der Sluijs, J.S. Risbey, P. Kloprogge, J.R. Ravetz, S.O. Funtowicz, S.Corral Quintana, Â Guimarães Pereira, B. De Marchi, A.C. Petersen, P.H.M. Janssen, R. Hoppe, and S.W.F. Huijs. RIVM/MNP Guidance for Uncertainty Assessment and Communication: Detailed Guidance Utrecht University & RIVM, 2003. J.P. van der Sluijs, P.H.M. Janssen, A.C. Petersen, P. Kloprogge, J.S. Risbey, W. Tuinstra, M.B.A. van Asselt, J.R. Ravetz, RIVM/MNP Guidance for Uncertainty Assessment and Communication: Tool Catalogue for Uncertainty Assessment Utrecht University & RIVM, , 2004. De Jong, A., J.A. Wardekker, J.P. van der Sluijs (2011). "Operationalising resilience as a policy-relevant concept for climate change adaptation: results from several case-studies". Paper presented at the conference 'Resilience 2011: Resilience, Innovation, and Sustainability: Navigating the Complexities of Global Change', 11-16 March 2011, Arizona State University, Tempe, Arizona, USA, 4 pp. Kunseler, E.M., J.A. Wardekker, J.P. van der Sluijs, L. van Bree (2010). "Expert assessment of health-relevant adaptation options". Paper presented at the International Conference 'Deltas in Times of Climate Change', 29 September - 2 October 2010, Rotterdam, the Netherlands, 2 pp. Remvikos, Y., Medina, S., Van der Sluijs, J. (2009). Aphekom - The Science/Decision Interface in Air Quality Policy: Lessons from a Local Multi-Stakeholder Process in France, Epidemiology, 20(6):S142. de Jong, A; van der Sluijs, J P.; Wardekker, J A. (2009). Uncertainties in Risk Estimations of Electromagnetic Fields of Overhead Power Lines, Epidemiology, 20(6):S220. Boogaard, H., Hoek, G., Knol, A., de Hartog, J., Slottje, P., Ayres, J.G, Borm, P., Brunekreef, B., Donaldson, K., Forastiere, F., Holgate, S., Kreyling, W.G., Nemery, B., Pekkanen, J., Stone, V., Wichmann, E., van der Sluijs, J. (2009). Concentration Response Functions for Ultrafine Particles and All-Cause Mortalilty and Hospital Admissions: Results of an European Expert Panel Elicitation, Epidemiology, 20(6):S40-S41. De Hartog, J., Knol, A., Boogaard, H., Slottje, P., van der Sluijs, J., Lebret, E., Cassee, F., Wardekker, A., Ayres, Jon., Borm, P., Brunekreef, B., Donaldson, K., Forastiere, F., Holgate, S., Kreyling, W., Nemery, B., Pekkanen, J., Stone, V., Wichmann, E., Hoek, G. (2009). Expert Elicitation on Health Effects Related to Exposure to Ultrafine Particles: Likelihood of Causality and Causal Pathways, Epidemiology, 20(6):S68-S69. Joop de Boer, J. Arjan Wardekker, Jeroen P. van der Sluijs, Frame-based guide to situated decision-making on climate change. Paper presented at the IARU International Scientific Congress on Climate Change: Global Risks, Challenges and Decisions, Copenhagen, 12 March 2009. J.P. van der Sluijs and S.O. Funtowicz (2008). Social-Ecological Transformation: the necessity of an accompanying transformation in practice and public understanding of expert policy advice. In: Proceedings of the International Workshop on Socio-ecological transformation and its impact on alterantive economic concepts and strategies, Rosa Luxemburg Foundation, Berlin, 29 June - 1 July 2007 (21 pp.). J.P. van der Sluijs, Onzekerheidscommunicatie. In: J. Mathijssen, A. Petersen, P. Besseling, A. Rahman, H. Don (Eds. ): Omgaan met Onzekerheid in Beleid. CPB, MNP, and RAND Europe, The Hague, Bilthoven, and Leiden, The Netherlands, 2007, p. 23-28. J.P. van der Sluijs and J.M. Douguet, Knowledge quality assessment: from diagnostic tools to enlarged deliberative process. Paper presented at The Ninth Biennial Conference of The International Society for Ecological Economics on 'Ecological Sustainability and Human Well-being', December 16-18, 2006, India Habitat Centre, New Delhi, India (full paper on conference CD-Rom). L. Maxim, and J.P. van der Sluijs, multicausality: from science to discourse. Evidence from a French case study. Paper presented at The Ninth Biennial Conference of The International Society for Ecological Economics on Ecological Sustainability and Human Well-being , December 16-18, 2006, India Habitat Centre, New Delhi, India (full paper on conference CD-Rom). Arthur Petersen, Jeroen van der Sluijs, Willemijn Tuinstra and Katherine Martin, Anticipation and Adaptation in Particulate Matter Policy: The European Union, the Netherlands, and United States, background paper for the Trans Atlantic Uncertainty Colloquium, organized by the US-Environmental Protection Agency, Washington D.C., 10-11 October 2006. Peter H.M. Janssen, Arthur C. Petersen, Jeroen P. van der Sluijs, James S. Risbey and Jerome R. Ravetz (2005) Towards Guidance in Assessing and Communicating Uncertainties, Proceedings of the 4th International Conference on Sensitivity Analysis of Model Output (SAMO 2004) Santa Fe, New Mexico, March 8-11, 2004. J. van der Sluijs, P. Kloprogge, J. Risbey, and J. Ravetz, Towards a Synthesis of Qualitative and Quantitative Uncertainty Assessment: Applications of the Numeral, Unit, Spread, Assessment, Pedigree (NUSAP) System. in: International Workshop on Uncertainty, Sensitivity and Parameter Estimation for Multimedia Environmental Modeling,(proceedings) Interagency Steering Committee on Multi Media Environmental Modeling, August 19-21 2003, Rockville MD, USA. p.81-86. J. van der Sluijs, James Risbey, Serafin Corral Quintana, Jerry Ravetz, Uncertainty management in complex models: the NUSAP method, in: Integrated Assessment and Decision Support. Ed. A.Jakeman, A. Rizzoli. Proceedings of IEMSS 2002 Conference, 24-27 June 2002, Lugano, Switzerland. p. 13-18. James Risbey, Jeroen van der Sluijs, Penny Kloprogge, Jerry Ravetz, Silvio Funtowicz, Serafin Corral Quintana, Application of a Checklist for Quality Assistance in Environmental Modelling to an Energy Model, in: Integrated Assessment and Decision Support. Ed. A.Jakeman, A. Rizzoli. Proceedings of IEMSS 2002 Conference, 24-27 June 2002, Lugano, Switzerland. p. 25-30. P. Kloprogge, J.P. van der Sluijs, Choice processes in modelling for policy support, in: Integrated Assessment and Decision Support. Ed. A. Jakeman, A. Rizzoli. Proceedings of IEMSS 2002 Conference, 24-27 June 2002, Lugano, Switzerland. p. 96-102. P. Kloprogge, and J. van der Sluijs, Choice processes in modelling for policy support, in: J.P. van der Sluijs (Ed. ), Hand-out book of the thematic workshop Managing Uncertainty in science for suSTainability: future research challenges for Europe of the Joint Research Centre, Launch Conference 6th Framework Programme, Heysel, Belgium, 2002, pp. 36-41. J.S. Risbey, J. van der Sluijs, P. Kloprogge, J. Ravetz, S. Funtowicz, and S. Corral Quintana, Application of a Checklist for Quality Assistance in Environmental Modelling to an Energy Model, Hand-out book of the thematic workshop Managing Uncertainty in science for suSTainability: future research challenges for Europe of the Joint Research Centre, Launch Conference 6th Framework Programme, Heysel, Belgium, 2002, pp. 25-30. J.P. van der Sluijs, J. Risbey, S. Corral Quintana, and J. Ravetz, Uncertainty management in complex models: the NUSAP method, Hand-out book of the thematic workshop Managing Uncertainty in science for suSTainability: future research challenges for Europe of the Joint Research Centre, Launch Conference 6th Framework Programme, Heysel, Belgium, 2002, pp. 19-24. J.P. van der Sluijs, Uncertainty management in integrated assessment models by NUSAP-informed delphic uncertainty ranking, in: A.Sors, A.Liberatore, S.Funtowicz, J.C..Hourcade, J.L..Fellous, Proceedings of the International Symposium Prospects for Integrated Assessment: Lessons Learnt from the Case of Climate Change Toulouse, France, European Commission, DG XII, 1997, p. 161-166. J.P. van der Sluijs, Omgaan met onzekerheden in Geintegreerde Klimaatmodellen, Short paper in SWOME marktdag boek Zesde Markdag, Milieu en Samenleving, SISWO, Amsterdam, 1995, p. 68-70. J.P. van der Sluijs, Inertie in de beleidsgeorienteerde wetenschappelijke adviespraktijk betreffende het klimaatvraagstuk. Short paper in SWOME marktdag boek 1994, SISWO, Amsterdam. 1994, p. 49-51. J.A. Wardekker, J.P. van der Sluijs (2011). Karakterisering van onzekerheid in effecten van klimaatverandering in Nederland. Report NWS-E-2011-79. Department of Science, Technology and Society, Copernicus Institute, Utrecht University, Utrecht. J.P. van der Sluijs (2011). Analyse monitoringsgegevens imidacloprid in oppervlaktewater bestrijdingsmiddelenatlas 2005-2009. Report NWS-E-2011-78. Department of Science, Technology and Society, Copernicus Institute, Utrecht University, Utrecht. J. de Boer, A. Wardekker, J. van der Sluijs, R. Kolkman (2011) Frames in climate change communication and decision-making (IC10) - Synthesis. Utrecht: Klimaat voor Ruimte. Health Council of the Netherlands (2011). Nanomaterials in waste. The Hague: Health Council of the Netherlands publication no. 2011/14E. J.H. Kwakkel, M.J.P. Mens, A. de Jong, J.A. Wardekker, W.A.H. Thissen, J.P. van der Sluijs (2011). Uncertainty Terminology. Knowledge for Climate. 30pp. J.P. van der Sluijs (2011). Deskundigenrapport inzake Reactie van Bayer CropScience B.V. n.a.v. het bezwaar (2010-19) van de Bijenstichting tegen de toelating door het Ctgb van Merit Turf 13321, Report commissioned by bijenstichting. Department of Science, Technology and Society, Utrecht University, Utrecht, The Netherlands. A. de Jong, J.A. Wardekker, J.P. van der Sluijs (2010) Onzekerheden en aannames in kwantitatieve analyse gezondheidsrisico van hoogspanningslijnen. Report commissioned by: Kennisplatform Elektromagnetische Velden. Department of Science, Technology and Society, Report NWS-E-2010-39, Utrecht University, Utrecht, The Netherlands. J.A. Wardekker, A. de Jong, J.P. van der Sluijs (2010). Communicatie van onzekerheden in rapportages van het RIVM Centrum voor Milieumonitoring Evaluatie en advies. Report commissioned by: National Institute for Public Health and the Environment (RIVM). Department of Science, Technology and Society, Report NWS-E-2010-37, Utrecht University, Utrecht, The Netherlands. Jeroen P. van der Sluijs, Rinie van Est and Monique Riphagen (red.) (2010). Ruimte voor klimaatdebat: zicht op interactie tussen klimaatpolitiek, -wetenschap en -media. Den Haag, Rathenau Instituut. Gezondheidsraad, (2009). Mondiale milieu-invloed op onze gezondheid, Signalement. Gezondheidsraad publicatie 2009/15, Den Haag. B. van Ruijven, J.P. van der Sluijs, D.P. van Vuuren, P. Janssen, P.S.C. Heuberger, B. de Vries (2009). Uncertainty from model calibration: applying a new method to transport energy demand modelling, Report NWS-E-2009-50, Department of Science Technology and Society, Copernicus Institute, Utrecht University. pp.35. J.A. Wardekker, J. de Boer, M.J. Kolkman, J.P. van der Sluijs, K.S. Buchanan, A. de Jong, A. van der Veen, 2009, Tool catalogue frame-based information tools, Report NWS-E-2009-3 Department of Science Technology and Society, Copernicus Institute, Utrecht University. pp.65. J.A. Wardekker, A. de Jong en J.P. van der Sluijs, 2008, Veerkrachtig Rotterdam: klimaatverandering als uitdaging. Workshopverslag. Report NWS-E-2008-300. Department of Science Technology and Society, Copernicus Institute, Utrecht University. pp.33. P. Slottje, J.P. van der Sluijs and A.B. Knol, 2008, Expert Elicitation - Methodological suggestions for its use in environmental health impact assessments. RIVM Letter Report 630004001/2008, National Institute for Public Health and the Environment, Bilthoven, 56 pp. Gezondheidsraad, 2008, Waterstof in het wegverkeer: voor- en nadelen voor de gezondheid van een nieuwe vorm van brandstof.. Signalement. Gezondheidsraad publicatie 2008/16, Den Haag. Ad Jeuken, Rob van der Krogt, Frans Claessen, Herman van der Most, Erik Opdam, Brendan McCarthy, MNP Joost Knoop, Evert Metselaar, Aalt Leusink, Teun Morsselt, Paul Opdam, Jeroen van der Sluijs, Tejo Spit, Pier Vellinga, 2008, Naar een klimaatbestendig NL, Kaders voor afweging, Definitiestudie Fase 1. Leven Met Water, Habiforum, en Klimaat voor Ruimte. 104pp. P. Kloprogge, J.P. van der Sluijs and A. Wardekker, 2007. Uncertainty communication: issues and good practice, report NWS-E-2007-199, Department of Science Technology and Society, Copernicus Institute, Utrecht University. 60 pp. S. Dessai and J.P. van der Sluijs, 2007. Uncertainty and Climate Change Adaptation - a Scoping Study, report NWS-E-2007-198, Department of Science Technology and Society, Copernicus Institute, Utrecht University. 95 pp. J.A. Wardekker and J.P. van der Sluijs, Evaluatie van Onzekerheidscommunicatie in de Milieubalans 2005, report NWS-E-2006-215, Department of Science, Technology and Society, Copernicus Institute for Sustainable Development and Innovation, Utrecht University, Utrecht, The Netherlands; December 2006. J.A. Wardekker and J.P. van der Sluijs, Wereldbeelden en Controversen rond Duurzaamheid. report NWS-E-2006-191, Department of Science, Technology and Society, Copernicus Institute for Sustainable Development and Innovation, Utrecht University, Utrecht, The Netherlands; November 2006. Andrea Ramírez Ramírez, Corry de Keizer and Jeroen P. van der Sluijs, Monte Carlo Analysis of Uncertainties in the Netherlands Greenhouse Gas Emission Inventory for 1990 - 2004, report NWS-E-2006-58, Department of Science, Technology and Society, Copernicus Institute for Sustainable Development and Innovation, Utrecht University, Utrecht, The Netherlands; July 2006. Wardekker, J.A. ; Van der Sluijs, J.P.: "Onzekerheidscommunicatie in de Milieubalans 2005: Resultaten Gebruikerspanel Stakeholders"; report NWS-E-2006-36, ISBN-10 90-8672-008-0, ISBN-13 978-90-8672-008-8; commissioned by: Netherlands Environmental Assessment Agency (MNP/RIVM), published by: Department of Science, Technology and Society, Copernicus Institute for Sustainable Development and Innovation, Utrecht University, Utrecht, The Netherlands; April 2006; 31 pp. + appendices. Wardekker, J.A. ; Van der Sluijs, J.P.: "Onzekerheidscommunicatie in de Milieubalans 2005: Resultaten Gebruikerspanel Beleidsmakers"; report NWS-E-2006-16, ISBN-10 90-8672-007-2, ISBN-13 978-90-8672-007-1; commissioned by: Netherlands Environmental Assessment Agency (RIVM/MNP), published by: Department of Science, Technology and Society, Copernicus Institute for Sustainable Development and Innovation, Utrecht University, Utrecht, The Netherlands; February 2006; 29 pp + appendices. J.-M. Douguet, J.P. van der Sluijs, M. O Connor, Â. Guimarães Pereira, S. Corral Quintana, J.R. Ravetz, Assurance Qualité de la Connaissance dans un processus délibératif élargi. De NUSAP aux Outils Kerbabel!" d aide à la Délibération, Cahier du C3ED n°06-03, Centre d Economie et d Ethique pour l Environnement et le Développement (UMR M063 IRD & UVSQ), Février 2006. Penny Kloprogge, Jeroen P. van der Sluijs and Arthur Petersen, 2005. A method for the analysis of assumptions in assessments: Exploring the value-ladenness of two indicators in the Fifth Dutch Environmental Outlook report commissioned by: Netherlands Environmental Assessment Agency (MNP), report published by: Netherlands Environmental Assessment Agency (MNP), Bilthoven and Unit Science, Technology and Society, Copernicus Institute, Utrecht University, Utrecht, the Netherlands, December 2005, 69 pp. Refsgaard, J. C., J. P. van der Sluijs, A. L. Hojberg, P. Vanrolleghem, HarmoniCa Guidance Uncertainty Analysis, Report commissioned by European Commission, European Commission, Brussels, Belgium, 46 pp. R. van Gijlswijk, P. Coenen, T. Pulles and J.P. van der Sluijs, Uncertainty assessment of NOx, SO2 and NH3 emissions in the Netherlands, 2003. TNO and Copernicus Institute Research Report, 79 pp. J.P. van der Sluijs, James Risbey and J. Ravtz, Uncertainty Assessment of VOC emissions from Paint in the Netherlands, Department of Science Technology and Society, Utrecht University, 2002, 90 pp. Jeroen P. van der Sluijs, Matthijs Hisschemoller, Joop de Boer, Penny Kloprogge. Climate Risk Assessment Evaluation of Approaches Summary and synthesis report. NRP report, Utrecht University, 2002, 40 pp. Jeroen P. van der Sluijs, Jose Potting, James Risbey, Detlef van Vuuren, Bert de Vries, Arthur Beusen, Peter Heuberger, Serafin Corral Quintana, Silvio Funtowicz, Penny Kloprogge, David Nuijten, Arthur Petersen, Jerry Ravetz.Uncertainty assessment of the IMAGE/TIMER B1 CO2 emissions scenario, using the NUSAP method. Dutch National Research Program on Climate Change, Bilthoven, 2002, 225 pp. J.P. van der Sluijs, W.C. Turkenburg and K. Blok, Een duurzaam klimaat vraagt geen woord maar daad: een kritische analyse van probleembeschrijving, strategie en maatregelenpakket voor klimaatverandering. in: NMP4 onder de loep, VROMRaad Achtergrondstudie 010, 2001, p 17-32. W.C. Turkenburg en J.P. van der Sluijs, Review van het RIVM instrumentarium voor de totstandkoming van lange termijn prognoses met betrekking tot de emissies van broeikasgassen. Sectie Natuurwetenschap en Samenleving, Universiteit Utrecht, rapportnr. NW&S-E-2000-13, mei 2000, 14 pp. B. Tinker, C. Azar, J.J.M. Berdowski, T. Boden, R. Darwin, W. Hare, B.J. Heij, M. Hulme, G. Komen, L. Meyer, S. Schapendonk, M.E. Schlessinger, C. Schuurmans, A.M. Solomon, J.P. van der Sluijs, M, Vaino, Report of the third session of the IMAGE Advisory Board, RIVM report 48158014, RIVM, 2000. Hisschemoller, M.; Boer, J. de ; Breukels, M. , Dunn, W. N. and Sluijs J.P. van der. Climate risk assessment: evaluation of approaches. Working document 1, Department of Science Technology and Society, Utrecht University, 2000, 28 pp. Van der Sluijs, J.P.,. 2000. Climate risk assessment: evaluation of approaches. Working document 2, Department of Science Technology, Utrecht University, 2000, 70 pp. J.P. van der Sluijs, Tuning NUSAP for its use in Integrated Model Quality Assurance the Case of Climate Change, Report in commission of European Commission Directorate General CCR, Joint Research Centre, Institute for Systems, Informatics and Safety, Ispra, Italy (contract no. 13970  1998  05 F1EI ISP NL), Department of Science Technology and Society, Utrecht University, Utrecht, March 1999. 36 pp. W.C. Turkenburg en J.P. van der Sluijs, Review RIVM-instrumentarium voor de CO2-emissieinventarisatie ten behoeve van de Milieubalans. Sectie Natuurwetenschap en Samenleving, Universiteit Utrecht, rapportnr. NW&S-99047, September 1999, 16 pp. J.P. van der Sluijs en W.C. Turkenburg, NMP 3 thema klimaat: een kritische analyse van het probleemveld, de beleidsdoelstellingen en de maatregelen, VROM-Raad rapport, 1998, 49 pp. J.P. van der Sluijs and K. Schulte Fischedick Omgaan met onzekerheden in wetenschap voor (milieu)beleid een inventarisatie van theorieën en aanpakken. Report in commission of Rathenau Instituut, The Hague, april 1997, 59 pp. J.P. van der Sluijs, Integrated Assessment Models and the Management of Uncertainties, IIASA working paper no. WP 96-119, Laxenburg, Austria, 1996, 80 pp. S. Toet and J.P. van der Sluijs, Climate Change: The Reporting in "De Telegraaf" 1970-1991. January 1992, ver. 1, contribution F7 to the Social Learning project (Research report NW&S Nr:92014), Utrecht, 1992, 13 pp. J.P. van der Sluijs, Experts in the Netherlands and the risk of Global Climate Change, 1946 - present, February 1992, contribution F6 to the Social Learning project (Research report NW&S Nr:92012), Utrecht, 1992, 50 pp. J.P. van der Sluijs, J.P., C.A. Hendriks, K. Blok, Feasibility of polymer membranes for carbon dioxide recovery from flue gases (Research report NW&S Nr. :92006), Utrecht, 1991, 48 pp. J.P. van der Sluijs, Kernenergie en stralingsrisico's, controversen rond risicoschattingen en normstelling van blootstelling aan lage dosis ioniserende straling, Wetenschapswinkel RUL, Leiden, 1988, 90 pp. Bezinningsgroep Energiebeleid, Klimaatprobleem: Oplossing in zicht, VU-Uitgeverij, ISBN 9053837043, 2000. J.P. van der Sluijs (ed.) The ULYSSES Web Tutorial on Particpatory Integrated Assessment, 1999. J.P. van der Sluijs, Onzekerheden in Risicoanalyse van Klimaatverandering, in: WTS, Tijdschrift voor Wetenschap Technologie en Samenleving, vol 6, 2, 1998, p.38..45. J. van der Sluijs (ed) Management of Uncertainty in Science for Sustainability. Hand-out booklet for the 11 November 2002 side event workshop: Managing Uncertainty in science for suSTainability: future research challenges for Europe, at the start conference of the 6th Framework Programme: "European Research 2002, The European Research Area and the Framework Programme", Brussels, 11-12-13 November 2002, 94 pp. J.P. van der Sluijs, and K. Schulte Fischedick, Gezagscrisis rond milieugetallen, Trouw (Podium), 6 februari 1999. Hamelinck, C., M. Londo and J. van der Sluijs. CO2-opslag niet raadselachtig. In: Technisch Weekblad, 1999: no 42, p.2. J.P. van der Sluijs and W.C. Turkenburg, CO2-ideologie (5), Ingezonden brief, NRC Handelsblad, 20-7-1995. J.P. van der Sluijs, Omgaan met onzekerheid rond nieuwe risico's, Capita selecta 2011-2012, module 10, Nieuwe Risico's en Aansprakelijkheid, Faculty of Law, economics and Governance, Utrecht, 16 December 2011. J.P. van der Sluijs, Uncertainties in Environmental Health Risk Assessment, Guest lecture for "European Public Health", Maastricht, 12 December 2011. J.P. van der Sluijs, Tools for Knowledge Quality Assessment, UFZ Biodiversity Roundtable "Assessing uncertainties in biodiversity science, policy and management", Leipzig, 7-8 December 2011. J.P. van der Sluijs, What do we know about the future climate? ESF workshop Rights to a Green Future, University of Bucharest, 31 October- 2 November 2011. J.P. van der Sluijs, The hope of Lisbon, Reconciliation in the Climate Change Debate, invited lecture at the Climate Crossroads Seminar, organized by University of Bergen, 25 October 2011, Ustaoset. J.P. van der Sluijs, Room for climate debate, invited key note at the Climate Crossroads Seminar, organized by University of Bergen, 24 October 2011, Ustaoset. J.P. van der Sluijs, Onafhankelijk onderzoek in een maatschappelijk krachtenveld? Over de invloed van belangen op wetenschappelijk onderzoek, Invited lecture Klankbordgroep Kennisplatform Elektromagnetische Velden, 20 oktober 2011, s Hertogenbosch. J.P. van der Sluijs, The neonicotinoid era of pest management: impacts on pollinators and ecosystems. Invited Crop protection seminar Universita di Padova, 13 October 2011. J.P. van der Sluijs, Urban governance in climate change adaptation: strategies on dealing with uncertainties, invited lecture at the International ENEP meeting on Urban governance in climate change adaptation, European Netwerk of Environmental Professionals, 6 October 2011, Brabanthallen, s Hertogenbosch, The Netherlands. J.P. van der Sluijs, Uncertainty & precaution concepts, tools, pitfalls, lessons, invited lecture at the Kick Off Meeting of the project "Uncertainty Assessments Related to Opening New Areas for Petroleum Activity", 30 September 2011, Institute for Marine Research, Bergen. J.P. van der Sluijs, The neonicotinoid era of pest management: impacts on pollinators and ecosystems, invited lecture at the Netherlands premiere of the movie Silent Snow, Sustainable Tuesday, 6 Sept 2011, Tuschinski, Amsterdam. J.P. van der Sluijs, Questions and Answers at the documentary movie Queen of the Sun, I love beeing festival, 3 September, Roest, Amsterdam. J.P. van der Sluijs, Model Quality Assessment progress and prospects, invited lecture at the international symposium Science in a digital society, 18 May 2011, Lisbon. J.P. van der Sluijs, From "speaking truth to power" towards "working deliberatively within imperfections", invited lecture at the symposium Climate Science in a Democratic Society, 4 May 2011, Hamburg. J.P. van der Sluijs and T. van Dijk, Effects of neonicotinoid pesticide pollution of Dutch surface water on non-target species abundance, invited lecture, 2nd International Workshop on Neonicotinoides, 28 March - 1st April 2011, Bath. J.P. van der Sluijs, Impacts of neonicotinoids on bee colonies, invited lecture, 2nd International Workshop on Neonicotinoides, 28 March - 1st April 2011, Bath. J.P. van der Sluijs, The neonicotinoid era of pest management: impacts on pollinators and entomofauna at large, invited key note lecture, 2nd International Workshop on Neonicotinoides, 28 March - 1st April 2011, Bath. J.P. van der Sluijs, Pollinator decline and systemic insecticides, invited lecture at European Premiere Silent Snow Movies that matter festival The Hague, 27 March 2011. J.P. van der Sluijs, From speaking truth to power towards working deliberatively within imperfections, presentation at the Lisbon workshop Reconciliation in the Climate Change Debate, 26-29 Jan 2011, Calouste Gulbenkian Foundation and EC Joint Research Centre. J.P. van der Sluijs, Knowledge Quality Assessment for complex risk issues. Invited lecture at the Institut des sciences de la communication du Centre national de la recherche scientifique (CNRS-ISCC), 30 November 2010, Paris, France. J.P. van der Sluijs, Post Normal Science: A reflective approach to Knowledge Quality Assessment. Invited lecture at the Institut des sciences de la communication du Centre national de la recherche scientifique (CNRS-ISCC), 24 November 2010, Paris, France. J.P. van der Sluijs, Toepassing van het voorzorgprincipe bij hoogspanningslijnen. Invited lecture at the Nederlandse Vereniging voor Stralingshygiëne (NVS) Najaarssymposium: 'Voorzorgprincipe', 12 November 2010, Amersfoort, The Netherlands. J.P. van der Sluijs, Climate proofing under deep uncertainty: meeting the challenges. Lecture on invitation of Staf Deltacommisaris, 8 November 2010, The Hague, The Netherlands. J.P. van der Sluijs, Lessons on interfacing science and policy from other (non fishery) fields. Invited lecture at the Institute for Marine Research in Bergen, 18 October 2010, Bergen, Norway. J.P. van der Sluijs, Lessons on interfacing science and policy from other (non fishery) fields. Invited lecture at the Working Group Fishery Systems, International Council for the Exploration of the Sea (ICES), 11 October 2010, Copenhagen, Denmark. J.P. van der Sluijs, Voorzorg bij onzekere milieu-gezondheidsrisico's. AV&S Congres Het Voorzorgbeginsel & Nieuwe Risico's, 6 October 2010, Rotterdam, The Netherlands. J.P. van der Sluijs, Climate proofing under deep uncertainty: meeting the challenges. Delta conference, 29 September 2010, WTC Rotterdam, The Netherlands. J.P. van der Sluijs, Post Normal Science in practice: experiences from The Netherlands, SVT Seminar, 20 Sept 2010, Bergen University, Bergen, Norway. J.P. van der Sluijs, Hoe beoordeelt het publiek risico's?, invited lecture at Vijfde Nationaal CCS Symposium CATO, Sessie: Impact van CCS op het publiek, 25 Juni 2010, Universiteit Utrecht, Utrecht, The Netherlands. J.P. van der Sluijs and J.A. Wardekker , Onzekerheidscommunicatie bij het RIVM Centrum voor Milieumonitoring. Invited lecture at National Institute for Public Health and the Environment (RIVM), 19 May 2010, Bilthoven, The Netherlands. J.P. van der Sluijs, Dealing with uncertainties: the need for Knowledge Quality Assessment, Invited lecture at UNESCO Institute for Higher Education (IHE) PRoACC session on Dealing with uncertainties, 11 May 2010, Delft, The Netherlands. J.P. van der Sluijs, Hoogspanningslijnen,EMV risico's, onzekerheden en het voorzorgsprincipe, invited lecture at the Scientific Steering Committee of the Knowledge Plaform on Electromagnetic Fields, 25 March 2010, Utrecht, The Netherlands. J.P. van der Sluijs, Climate Change: facts and uncertainties, invited lecture at the meeting of the Raad van Toezicht of the Knowlegde for Climate programme, 17 March 2010, Utrecht, The Netherlands. J.P. van der Sluijs, Hoogspanningslijnen,EMV risico's, onzekerheden en het voorzorgsprincipe, invited lecture at the directiebrede bijeenkomst directie Risicobeleid VROM, 1 March 2010, Ministry of VROM, The Hague, The Netherlands. J.P. van der Sluijs, Climate Change: facts and uncertainties, invited lecture at the meeting of the Polman Group, 26 January 2010, Utrecht, The Netherlands. J.P. van der Sluijs, Model Quality Assessment, invited lecture at the SENSE course S020 Uncertainty Analysis, 12 February 2010, Wageningen, The Netherlands. J.P. van der Sluijs, The NUSAP method for uncertainty assessment, invited lecture at the HEIMTSA, INTARESE, 2-FUN, and NoMiracle Joint Winter School on Uncertainty, 20 - 22 January 2010, Loch Tay, UK. J.P. van der Sluijs, Hoogspanningslijnen,EMV risico's, onzekerheden en het voorzorgsprincipe, invited lecture at the fourth meeting of the Klankbordgroep EMV of the Netherlands Knowledge Platform on Electromagnetic Fields, RIVM, TNO, KEMA, Agentschap telecom, de GGD'en, ZonMW, 20 January 2010, Stadhuis Den Bosch, Den Bosch, The Netherlands. J.P. van der Sluijs, " Uncertainties in Environmental Health Risk Assessment ", invited guest lecture in the education program "European Public Health", University of Maastricht, 3 December 2009, Maastricht, The Netherlands. J.P. van der Sluijs, Nano Risks, Uncertainty and the Precautionary Principle, invited lecture at the "Nanoregulering symposium: reuze-oplossingen voor dwergproblemen?" 13 November 2009, Universiteit van Tilburg, The Netherlands. , (powerpoint) invited lunchlecture Studium Generale Utrecht University, 21 October 2009, Utrecht, The Netherlands. J.P. van der Sluijs, Uncertainty complexity and post normal science: the need for new ways of interfacing science and policy, invited KNMI Colloquium, October 9, 2009 Royal Netherlands Meteorological Institute, Bilthoven, The Netherlands. J.P. van der Sluijs, Knowledge Quality Assessment tools for reflective science, invited lecture at ESF-LiU Conference 'Philosophy for Science in Use', 28 September - 2 October 2009, Linkoping, Sweden. J.P. van der Sluijs, "Coping with Uncertainty in Science for Policy: The need for Knowledge Quality Assessment", Invited Lecture at the UNESCO-IHE international summer school "Climate Change in Integrated Water Management, September 8, 2009, UNESCO-IHE, Delft, The Netherlands. J.P. van der Sluijs, Uncertainty in global change models, Invited lecture at the SENSE Summer School Understanding Global Environmental Change: Processes, Compartments and Interactions, Hoeven, The Netherlands, 5 September 2009. J.P. van der Sluijs and and Kjellrun Hiis Hauge, Plurality of views in fishery science for policy, invited key note at MARE conference People and the Sea V: Living with Uncertainty and Adapting to Change, 9 July 2009, Amsterdam. J.P. van der Sluijs, invited co-track chair of track "Sustainability Science - Bridging the Gap between Analytical and Normative Knowledge (Track 1A)", 15th Annual International Sustainable Development Research Conference, 5-8 July 2009, Utrecht. J.P. van der Sluijs, Knowledge Quality Assessment: Identification and management of uncertainties, Invited lecture at the workshop Monitoring the effects of climate change on human and animal health, 31 March 2009, Belgian Science Policy, Brussels. J.P. van der Sluijs, Invited chair of parallel session on uncertainty and risk governance, Risk governance and policy learning within and between risk fields, Final Conference of the RiskBridge Project (European Commission Funded FP6 Coordination Action), Brussels, March 26-27 2009. J.P. van der Sluijs, Knowledge Quality Assessment for a Sustainable Earth. Invited lecture at the Nederlands Partnerschap voor Duurzame Aarde onderzoek (NPDA) workshop, NWO, 26 March 2009, Amsterdam. J.P. van der Sluijs, "
" Onzekerheidscommunicatie over EMV risico's. Invited key note at seminar Onzekerheidscommunicatie: Onzekerheden en EMV, functie en parktijk. 11 February 2009, RIVM Bilthoven. J.P. van der Sluijs, Pedigree analysis of climate models. Invited lecture, Copenhagen, 9 January 2009. J.P. van der Sluijs, The NUSAP method for uncertainty management, Invited Guest lecture in the MSc course "Integrated Environmental Assessment: Pollution Management". Wageningen, 7 January 2009. J.P. van der Sluijs, "Onzekerheid en klimaatadaptatie", invited lecture at the national conference "Op weg naar een klimaatbestendige samenleving", organised by Klimaat voor Ruimte and Kennis voor Klimaat, 27 november 2008, De Doelen, Rotterdam. J.P. van der Sluijs, Communiceren over wetenschappelijke onzekerheden, overwegingen voor een goede praktijk, Invited lecture, 13e vergadering bestuur Kennisplatform EMV, 's Hertogenbosch, 20 november 2008. J.P. van der Sluijs , "Coping with scientific uncertainty in the science-policy interface: From "speaking truth to power" to "working deliberatively within imperfections"" Invited lecture at the MSc Course Risk and Uncertainty, Maastricht Graduate School of Governance - 4 November 2008. J.P. van der Sluijs , Uncertainty in the Science-Policy Interface. Invited lecture at the Workshop on Uncertainty and Policy - Fisheries in dialogue with other sectors. Organised by the Working Group on Fisheries Systems / JAKFISH / CEVIS, 13 October 2008, Copenhagen, Denmark. 29 September - 03 October 2008 Amsterdam, The Netherlands. J.P. van der Sluijs, Uncertainty, complexity & post-normal science: the need for new ways of interfacing climate science and climate policy. Invited lecture at the Workshop "Science Policy Interface and Climate Change", Utrecht, 29 September 2008 organized by the Netherlands "Knowledge for Climate" program. J.P. van der Sluijs, "Coping with Uncertainty in Science for Policy: The need for Knowledge Quality Assessment", Invited Lecture at the UNESCO-IHE international summer school "Climate Change in Integrated Water Management, September 10, 2008, UNESCO-IHE, Delft, The Netherlands. J.P. van der Sluijs, "Science for Policy, From 'speaking truth to power' to 'working deliberatively within imperfections'", Invited lecture at TNO "Terugblik workshop Kwaliteit van Leefomgeving", 4 June 2008, Lage Vuurse, The Netherlands. J.P. van der Sluijs, The NUSAP method for uncertainty management, Invited Guest lecture in the MSc course "Integrated Environmental Assessment: Pollution Management". Wageningen, 11 January 2008. J.P. van der Sluijs, Knowledge Quality Assessment, An Introduction. Invited lecture at the INTARESE training on Uncertainty & Quality, organised by the INTARESE project and the European Environment Agency, Copenhagen 17 & 18 October 2007. J.P. van der Sluijs, Tools for Knowledge Quality Assessment. Invited lecture at the INTARESE training on Uncertainty & Quality, organised by the INTARESE project and the European Environment Agency, Copenhagen 17 & 18 October 2007. J.P. van der Sluijs, Stakeholder participation in Knowledge Production. Invited lecture at the INTARESE training on Uncertainty & Quality, organised by the INTARESE project and the European Environment Agency, Copenhagen 17 & 18 October 2007. J.P. van der Sluijs, Post Normal Science: working deliberatively within imperfections. Invited Lecture at the NATO Advanced Study Institute "Uncertainties in environmental modelling and consequences for policy making", Vrsar, September 30 to October 11, 2007 (lecture was on Oct 10 2007). J.P. van der Sluijs, Social-Ecological Transformation: the necessity of an accompanying transformation in practice and public understanding of expert policy advice, Invited lecture at the Rosa Luxemburg Foundation International Workshop: "Social-ecological Transformation / Reconstruction as a Central Challenge for Alternative Economic Conceptions and Strategies of economic policies", Berlin, 29 June - 1 July 2007. J.P. van der Sluijs, Uncertainty in global change models, Invited lecture at the SENSE Summer School Understanding Global Environmental Change: Processes, Compartments and Interactions, Hulsthorst, The Netherlands, 18-24 May 2007. J.P. van der Sluijs, Uncertainty communication in the Science Policy Interface. Invited lecture at the "International Workshop on Uncertainty in Environmental Modelling", Organized by Geocentrum, Uppsala University, Uppsala, 28th-30th March 2007. J.P. van der Sluijs, The NUSAP method for uncertainty management, Invited Guest lecture in the MSc course "Integrated Environmental Assessment: Pollution Management". Wageningen, 10 January 2007. J.P. van der Sluijs, " Uncertainties in Environmental Health Risk Assessment ", invited guest lecture in the education program "European Public Health", University of Maastricht, Maastricht, 22 November 2006. J.P. van der Sluijs, The NUSAP-system for Uncertainty Assessment, invited lecture at the workshop "External costs of a potential severe nuclear accident in Belgium", StudieCentrum voor Kernenergie (SCK), Brussels, 26 October 2006. J.P. van der Sluijs, Onzekerheidscommunicatie, invited lecture at workshop "Bandbreedte bij kustmorfologische projecten", RIKZ and WL|Delft Hydraulics, Delft, 25 October 2006. J.P. van der Sluijs and J. Ravetz, Assessing the Quality of Evidence for Complex and Contested Policy Decisions, invited presentation at the Trans Atlantic Uncertainty Colloquium, organized by the US-Environmental Protection Agency, Washington D.C., 10-11 October 2006. J.P. van der Sluijs, Knowledge Quality Assessment in the Science-Policy Interface, Invited (electronic) lecture (4 October 2006) at the eKAM school on knowledge assessment and extended participation, Organised by the Worldwide Network on Science and Society Interfaces, coordinated by the Knowledge Assessment Methodologies Group (EC-JRC) in collaboration with the University of La Laguna (Spain); Utrecht, Ispra, La Laguna, Bergen, Los Andes, Acores, Santiago, 2-6 October 2006. J.P. van der Sluijs, Assessing the Quality of Evidence for Complex and Contested Policy Decisions, invited presentation at the UoB-JRC Haugastøl Mountain Uncertainty Workshop, organised by the University of Bergen and the European Commission Joint Research Center, Haugastøl, Norway, 8-10 September 2006. J.P. van der Sluijs, Approaches and Methods for the Assessment and Communication of Uncertainty, invited lecture at the seminar Management and Communication of Uncertainty in the Science-Policy Interface, organised by Havforskningsinstituttet and Senter for vitenskapsteori, UiB, Bergen, Norway, 7 September 2006. J.P. van der Sluijs, Post Normal Science, invited lecture at the THEMES summer school - Analysing Complexity, Barcelona, Spain, 10 June 2006. J.P. van der Sluijs, The NUSAP system for uncertainty assessment, invited lecture at the THEMES summer school - Analysing Complexity, Barcelona, Spain, 12 June 2006. J.P. van der Sluijs, The Precautionary Approach to Risk Management, invited lecture at the THEMES summer school - Analysing Complexity, Barcelona, Spain, 13 June 2006. J.P. van der Sluijs, Knowledge Quality Assessment in the Science-Policy Interface, invited lecture at TNO workshop Onzekerheid en Risico , Wassenaar, Netherlands, 14 April 2006. J.P. van der Sluijs, "Knowledge Quality Assessment in the Science Policy Interface" Invited opening key note of the ERICA EUG Workshop on Scientific Uncertainty, 27-28 March 2006, Ljubljana. J.P. van der Sluijs, "The Precautionary Principle and Uncertainty" Three day invited training course at Escola Nacional de Saúde Pública Sergio Arouca, Fiocruz, 21-22 March 2006, Rio de Janeiro. J.P. van der Sluijs, "Knowledge Quality Assessment" Invited key note (7 Feb 2006) at ALARM general meeting, Lisbon, 6-10 February 2006. J.P. van der Sluijs, "Current Practice: An assessment of the operational use of uncertainty assessment to modelling activities in RIVM, Netherlands", invited lecture at the FRMRC Practitioners' workshop Risk and Uncertainty, organised by the UK Flood Risk Management Research Consortium, Lancaster University, 31 January 2006. J.P. van der Sluijs, "Guidance for Uncertainty Assessment, Management and Communication", Invited one-day training course for Ph.D. students, organized by The Integrated Assessment Society (TIAS), Enschede, 7 December 2005. J.P. van der Sluijs, "Uncertainty in Environmental Risk Management, Concepts, approaches, and Methods of Analysis", Invited lecture (10 November 2005) at the "Knowledge Assessment Methodologies Fall School", organized by the Knowledge Assessment Methodologies Sector of the Institute for the Protection and Security of the Citizen at the European Commission's Joint Research Centre, Ispra, 7-11 November 2005. J.P. van der Sluijs, "Uncertainty analysis and assessment", guest lecture at the SENSE Ph.D. Course "Modelling issues in energy, materials and waste analysis", organized by the SENSE Research School, Utrecht, 21 October 2005. J.P. van der Sluijs, "TIAS Summerschool 2005 - Synthesis", invited lecture at the "TIAS Summerschool 2005 Stakeholder Participation and Modelling in Sustainable Resource Management", organized by The Integrated Assessment Society (TIAS), Osnabruck, 11-12 July 2005. J.P. van der Sluijs "L Assurance de la Qualité de la Connaissance comme processus de dialogue multi-acteurs", invited lecture at the International Summer School "Les outils de participation des acteurs a la gouvernance environmentale des territoires", organized by Université de Corse and Université de Versailles Saint-Quentin-en-Yvelines, Corte, 4-10 July 2005. J.P. van der Sluijs, "rethinking uncertainty, challenges for science and society", Invited lecture at the International Workshop "Seeking an agenda: Enviromental and technology ethics - Relevant research themes", organized by the Altonaer Stiftung für philosophische Grundlagenforschung, Hamburg, 27-29 June 2005. J.P. van der Sluijs, A multi-disciplinary approach to cope with uncertainty monsters in environmental Foresight, Invited plenary lecture at the IFIP/IIASA/GAMM Workshop on Coping with Uncertainty (CwU), December 13-16, 2004, IIASA, Laxenburg, Austria. J.P. van der Sluijs, Uncertainty Assessment and Communication. Invited seminar at the UK Flood Hazard Research Centre, London, 23 November 2004. J.P. van der Sluijs, Uncertainty Assessment for complex problems: a review of state of the art tools. Invited plenary lecture at the UK Workshop on Flood Risk Management, Nottingham, 6 October 2004. J.P. van der Sluijs, Defining Uncertainty: Concepts and Methods of Analysis in Integrated Environmental Assessment. Invited lecture at the TIAS Summerschool Integrated Assessment for Environmental Management, Osnabrück 26 July 2004. J.P. van der Sluijs, Taming the uncertainty monster. Invited seminar at the International Institute for Applied Systems Analysis (IIASA), Laxenburg, 2 Juli 2004. J.P. van der Sluijs, "Insights from the Symposium Uncertainty and Precaution in Environmental Management", Invited plenary keynote at the International Environmental Modeling and Software Society 2004 conference, Osnabrück, 17 June 2004. Guidance for Uncertainty Assessment and Communication. 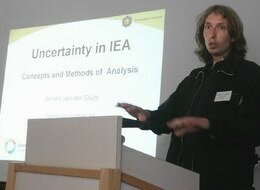 Invited presentation at the European Environmental Agency (EEA) workshop on Uncertainty Guidance, Copenhagen, 22 October 2003. 'Dutch guidelines for uncertainty scanning and assessment'. Invited key-note lecture at the Workshop of the UN/ECE Task Force on Integrated Assessment Modelling: Uncertainty Treatment in Integrated Assessment Modelling, January 24-25, 2002, EMEP Center for Integrated Assessment Modelling (CIAM) at the International Institute for Applied Systems Analysis (IIASA) Laxenburg, Austria.
' Uncertainty assessment VOC-emissions from paint'. Invited Lecture presented to the Knowledge Assessment and Sensitivity Analysis groups of the EC Joint Research Center at Ispra, Itali, Februari 8, 2001. 'Uncertainty and Quality in Integrated Environmental Assessment: The NUSAP system', Invited speaker at the EU-Advanced Course in Decision Tools and Processes for Integrated Environmental Assessment, Barcelona, September 20- October 1 1999. 'Uncertainty and Quality in Environmental Assessment'. Invited Plenary Key-note lecture, SETAC-Europe Annual Meeting, Bordeaux , 14-18 April 1998. J.P. van der Sluijs, (Uncertain) Climate Change: Challenges to Human Rights. Short lecture at the Utrecht Centrum voor Duurzame Aarde (UCAD) symposium "Multidisciplinary Research for Sustainability", November 11, 2010, Utrecht, The Netherlands. J.P. van der Sluijs, Indicators of academic performance: SENSE and nonsense, Lunch Colloquium at the division Science technology and Society, Utrecht University, 22 March 2010, Utrecht. Jeroen van der Sluijs, Bijensterfte: Oorzaken, gevolgen, maatregelen. Presentatie tijdens persconferentie ter gelegenheid van de aanbieding van de petitie Stop de Bijensterfte aan de vaste Kamercommissie LNV, Nieuwspoort, Den Haag, 24 November 2009. Jeroen van der Sluijs, Risicoinschattingen EMV Hoogspanningslijnen en kinderleukemie: Kritische reflectie op de aannamen, lecture at the expert workshop "Risicoinschattingen van Elektromagnetische Velden van Hoogspanningslijnen", Utrecht University, 16 November 2009, Utrecht. Jeroen van der Sluijs, Honeybee decline, causes and effects, Lunch lecture at the division Science technology and Society, Utrecht University, 19 October 2009, Utrecht. Jeroen de Hartog, Anne Knol, Hanna Boogaard, Pauline Slottje, Jeroen van der Sluijs, Erik Lebret, Flemming Cassee, Arjan Wardekker, Jon Ayres, Paul Borm, Bert Brunekreef, Ken Donaldson, Francesco Forastiere, Stephen Holgate, Wolfgang Kreyling, Benoit Nemery, Juha Pekkanen, Vicky Stone, Erich Wichmann, Gerard Hoek, Expert elicitation on health effects related to exposure to ultrafine particles: likelihood of causality and causal pathways, oral presentation at the International Society for Environmental Epidemiology Annual General Meeting - 2009 (ISEE 2009) Dublin, 26-29 August 2009. Hanna Boogaard, Gerard Hoek, Anne Knol, Jeroen de Hartog, Pauline Slottje, Jon G Ayres, Paul Borm, Bert Brunekreef, Ken Donaldson, Francesco Forastiere, Stephen Holgate, Wolfgang G. Kreyling, Benoit Nemery, Juha Pekkanen, Vicky Stone, Erich Wichmann, Jeroen van der Sluijs, Concentration response functions for ultrafine particles and all-cause mortalilty and hospital admissions: results of an European expert panel elicitation, oral presentation at the International Society for Environmental Epidemiology Annual General Meeting - 2009 (ISEE 2009) Dublin, 26-29 August 2009. Wardekker, JA., P. Westerlaan, J.P. van der Sluijs, P.A. Verweij, A. de Jong (2009). "Klimaatadaptatie: Veerkracht in het Waddengebied". Presentation at the workshop "Veerkrachtige Wadden, natuurlijk! ", Utrecht University, Utrecht, 26 June 2009. Hanna Boogaard, Gerard Hoek, Anne Knol, Jeroen de Hartog, Pauline Slottje, Jeroen P. van der Sluijs, "Expert panel: health effects of ultrafine particles", lecture at the APHECOM general meeting, 8 May 2009, Vienna. J.P. van der Sluijs, "Expert Judgement and uncertainty" lecture at the APHECOM general meeting, 7 May 2009, Vienna. J.P. van der Sluijs, "Onzekerheid en klimaatadaptatie", presentation at the Workshop Veerkracht van Natuur - van Vaag naar Meetbaar, 22 April 2009, PBL Bilthoven. J.P. van der Sluijs, "Expert Judgement and uncertainty", presentation at the IRAS-RIVM-INTARESE Expert Workshop on Ultrafine Particles and Health, Utrecht, 25 August 2008. J.P. van der Sluijs, "Quantification of uncertain quantities using subjective probability distributions" presentation at the IRAS-RIVM-INTARESE Expert Workshop on Ultrafine Particles and Health, Utrecht, 26 August 2008. J.P. van der Sluijs, "APHEKOM WP7 Knowledge Quality Assessment: Interactive Online Tool for discussions of uncertainties and indicators in evaluating APHIAs in Europe", presentation at APHEKOM first meeting, organized by the Department of Environmental Health, French Institute of Public Health Surveillance (InVS), Paris, 1-2 July 2008. Wardekker, J.A., A.C. Petersen, J.P. van der Sluijs (2007). "Religious positions on climate change and climate policy in the United States". International Conference "Communicating Climate Change: Discourses, Mediations and Perceptions", University of Minho, Braga, Portugal, 19-20 November 2007. J.P. van der Sluijs and J.M. Douguet, Knowledge quality assessment: from diagnostic tools to enlarged deliberative process. Paper presented at The Ninth Biennial Conference of The International Society for Ecological Economics on Ecological Sustainability and Human Well-being , December 16-18, 2006, India Habitat Centre, New Delhi, India. L. Maxim, and J.P. van der Sluijs, multicausality: from science to discourse. Evidence from a French case study. Paper presented at The Ninth Biennial Conference of The International Society for Ecological Economics on Ecological Sustainability and Human Well-being , December 16-18, 2006, India Habitat Centre, New Delhi, India. J.P. van der Sluijs, "Uncertainty Methods". Invited guest lecture in the MSc Course "Research methods" of the master programmes "management, policy-analysis and entrepreneurschip in health and life science" and "international public health", Free University of Amsterdam, 22 September 2006. J.P. van der Sluijs, Towards a common understanding of the Precautionary Principle, oral presentation (3 Sept. 2006) at the International Conference on Environmental Epidemiology & Exposure, jointly organised by the International Society for Environmental Epidemiology (ISEE) and the International Society of Exposure Analysis (ISEA), Paris, France, 2-6 September 2006. J.P. van der Sluijs, The need for guidance for dealing with uncertainty, assumptions and value commitments in environment and health assessment, oral presentation (4 Sept. 2006) at the International Conference on Environmental Epidemiology & Exposure, jointly organised by the International Society for Environmental Epidemiology (ISEE) and the International Society of Exposure Analysis (ISEA), Paris, France, 2-6 September 2006. J.P. van der Sluijs, The NUSAP method for uncertainty management, Guest lecture in the MSc course Integrated Environmental Assessment: Pollution Management . Wageningen, 11 January 2006. J.P. van der Sluijs, "Communiceren over onzekere kennis", Workshop: Evaluatie onzekerheidscommunicatie MNP Milieubalans 2005 - doelgroep beleidmakers", Department of Science, Technology and Society, Utrecht University, Den Haag, 15 December 2005. J.P. van der Sluijs "Uncertainty communication", Expert Workshop Uncertainty in Health Risks of Particulate Matter, Utrecht Policy Laboratory, Utrecht, 20 May 2005. J.P. van der Sluijs, "The Precautionary Principle", lecture at "Colloque Incertitude et Environnement, 17e journées Scientifiques de la Société d' Écologie Humaine", organized by "La Société d Ecologie Humaine" and "Université de la Méditerranée Site d Arles (DESMID) et Site de Nice", Arles, 23-25 November, 2005. J.P. van der Sluijs, The NUSAP method for uncertainty management, Guest lecture in the MSc course Integrated Environmental Assessment: Pollution Management . Wageningen, 14 January 2005. Towards multi-dimensional uncertainty assessment for complex environmental problems. Presentation in the break-out session on Uncertainty, Assumptions and Value Commitments in Environmental Assessment at the International Workshop Interfaces between Science and Society, Milano, 27-28 November 2003. Uncertainty in Integrated Assessment. Guest lecture in the MSc Course Intergated Assessment of the International Master Integrated Assessment of the universities of Twente and Osnabruck, Enschede, 6 November 2003. RIVM/MNP Guidance for Uncertainty Assessment and communication" Presentation at the Mini-symposium "The management of uncertainty in risk science and policy", World Congress on Risk, Brussels, 22-25 June 2003. The NUSAP method for uncertainty management, Guest lecture in the MSc course Integrated Environmental Assessment: Pollution Management. Wageningen, 15 januari 2003. Management of Uncertainty in Science for Sustainability: research challenges for Europe. FP6 launch side-workshop "Management of Uncertainty in Science for Sustainability, future research challenges for Europe", "European Research 2002, The European Research Area and the Framework Programme", Brussels, 11-12-13 November 2002. Onzekerheidsanalyse Emissiecijfers verzuring, resultaten expertbervraging. 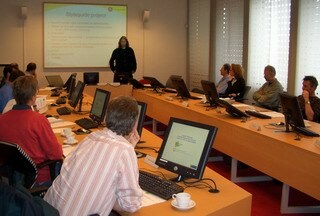 Presentatie voor de Wergroep Emissie Monitoring (WEM), Utrecht, 17 December 2002. Onzekerheidsanalyse Emissiecijfers verzuring van de Emissiemonitor: briefing expertbevraging. Presentatie voor de Wergroep Emissie Monitoring (WEM), Utrecht, 19 September 2002. Onzekerheidsanalyse Emissiecijfers verzuring van de Emissiemonitor: plan van aanpak. Presentatie voor de Wergroep Emissie Monitoring (WEM), Utrecht, 30 juli 2002. Uncertainty management in complex models: the NUSAP method, IEMSS 2002 Conference Integrated Assessment and Decision Support, , Lugano, Switzerland, 24-27 June 2002. 'Climate risk assessment, Evaluation of approaches' Final conference of the Dutch National Research Program on Climate Change, 15 Nov 2001. 'Uncertainty assessment of the IMAGE/TIMER B1 CO2 emissions scenario using the NUSAP method' Final conference of the Dutch National Research Program on Climate Change, 15 Nov 2001. 'Assessing pedigree and strength of model parameters'. Presentation at the workshop: Assessment of uncertainty and strength in the IMAGE/TIMER energy model 12-13 June 2001, Loosdrecht, The Netherlands. Workshop: Assessment of uncertainty and strength in the IMAGE/TIMER energy model. 12-13 June 2001, Loosdrecht, The Netherlands. (Entire workshop organised and chaired by me, 19 participants from all over Europe). 'Uncertainty & the IPCC TAR' Forum contribution at the SENSE Ph.D. Course 'Environmental Research in Context', Arnhem, 30 maart 2001. 'Uncertainy and Scales in IAMs' presentation at the EFIEA Matrix Workshop "Scaling Issues in Integrated Assessment, 12-19 July 2000, Mechelen, Netherlands. 'Uncertainty & Climate Change' Forum contribution at the SENSE Ph.D. Course 'Environmental Research in Context', Arnhem, 7 April 2000. 'The ULYSSES Web Tutorial on Participatory Integrated Assessment'. ULYSSES project meeting, Brussels, 10-12 March 1999. 'Using NUSAP for IAM-quality assurance', Presentation at The European Forum on Integrated Environmental Assessment (EFIEA) Workshop on Uncertainty, Baden bei Wien, Austria, July 10-18, 1999. 'Postnormale Wetenschap'. Invited speaker at the Algemene Natuurwetenschappen Studiedag "Filosofie, Natuurwetenschappen en Samenleving", Instituut voor Didactiek en Onderwijspraktijk, Free University of Amsterdam, Amsterdam, December 2, 1998. 'Risk management under uncertainty'. Short presentation at the IPCC Expert meeting on Risk Management, 30 April - 1 May 1998, Toronto. 'Consensusvorming in het Klimaatdebat'. Invited lecture at Fysica '98, Jaarvergadering Nederlandse Vereniging van Natuurkundigen, Delft, April 21, 1998. 'Post Normal Science'. Invited lecture, Filosofische kring van de KNCV, Utrecht, April 2 1998. 'Uncertainty and Subjectivity in Integrated Environmental Assessment', Forum contribution at the First Workshop of the European Forum on Integrated Environmental Assessment, WTC, Amsterdam, 12-14 March 1998. 'Anchoring Amid Uncertainty' Invited lecture at the KNMI (KNMI Colloquium series), De Bilt, December 2, 1997. Review-presentation of A. Liberatore's paper Facing Global Warming: The Interactions between Science and Policy Making in the European Community. Workshop Knowledge Power and Participation in Environmental Policy, Leiden, September 18-20. Interview in the TELEAC television program Kwintessens, aflevering "Het Broeikaseffect, Wetenschap als Orakel". January 15, 1997 (this program has been rebroadcasted several times since). 'Uncertainty and Complexity in Integrated Assessment Models of the Greenhouse Effect'. Presentation at the International Conference on "Climate Change, Cataclysmic Risk and Fairness", IIASA/LOS, Laxenburg, July 22, 1996. 'Uncertainty Management in Integrated Assessment Models'. Presentation at the Mid-Summer Workshop of the Young Scientist Summer Program, IIASA/YSSP, Laxenburg, July 17, 1996. 'Some Reflections on Expert Advice for Rational and Informed Policy Making'. Presentation at the Young Scientists Summer Program Symposium on Scientific Expertise, IIASA/YSSP, Laxenburg, July 26, 1996. 'De CO2 Mythe, een Reactie'. Forumcontribution, Geochemische Kring, Utrecht, May 11, 1995. 'Omgaan met Onzekerheden in Geïntegreerde Klimaatmodellen'. Presentation at the Zesde jaarlijkse marktdag voor Sociaal-Wetenschappelijk Onderzoek Milieu en Energie, SISWO, Den Haag, April 13, 1995. 'Inertie in de Beleidsgeorienteerde Adviespraktijk Betreffende het Klimaatvraagstuk'. Presentation at the Vijfde jaarlijkse marktdag voor Sociaal-Wetenschappelijk Onderzoek Milieu en Energie, SISWO, Utrecht, March 29, 1994. Modellen van de Lange Termijn Koolstofcyclus'. Invited lecture within the College cyclus Global Change, Rijksuniversiteit Leiden, November 12, 1993. F.T. Yavuz, J. van der Sluijs, W. C. Turkenburg, C.F. Bos and T. Wildenborg, Long Term Probabilistic Risk Assessment of Underground Storage of CO2, Poster presented at 8th Netherlands Earth Science Conference, Veldhoven, Netherlands, April 24-25, 2006. 'Uncertainty Management in Integrated Modelling, the IMAGE Case'. Posterpresentation at the International Conference on Climate Change Research, NOP-MLK, Maastricht, December 7, 1994. 'Biogenic Feed Backs in the Carbonate Silicate Geochemical Cycle and the Global Climate'. International Conference on CO2 Chemistry, Hemavan, Zweden, September 22, 1993.